Since the dawn of time, the Meepit and the Feepit have been mortal enemies destined to fight. Playing as the Blue Feepit, your goal is to defeat the Meepit opponents waiting for you in five different stages. Utilize your fighting skills to come out on top with an avatar or a trophy! 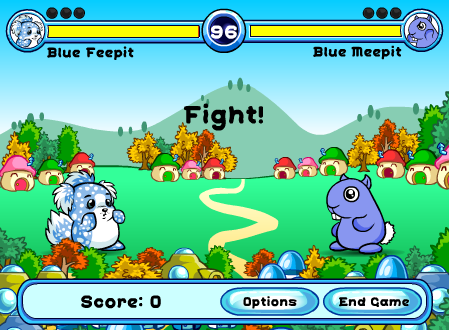 Meepit vs. Feepit plays like a standard fighting game. Each player will use their attacks to try to defeat their opponent and defend against oncoming attacks. The first player to lose all of their HP or have the lowest HP at the end of the round loses. Rounds can last up to 99 seconds but will end when a player has been defeated. To win each stage, you must defeat the Meepit three times. If any of the Meepits defeat you three times in a stage, it's game over! Below are the default controls. These can be changed to your liking by choosing Options at any time. Keep in mind that you can also attack while crouching or jumping. If you punch or kick a Meepit that is blocking without crouching, you will hit them if you are crouched. If you press the punch and kick keys in a sequence, you can perform a special combo. When making combos, you need to wait for the animation for your current attack to end before you press the next key in the sequence. If you don't, your combos will not work! If a combo is used on a defending foe, you will still hit them as you pass by them. This is because it counts as an attack from behind. In each stage you will face a different kind of Meepit, but they all have the same amount of HP and do the same amount of damage. The amount of points you earn depends on the type of attacks used. The Meepit must not be blocking for you to score points! Roll Attack/Torpedo Dive: 13 points + 6 points when the Meepit hits the ground. Additionally, you earn an extra 100 bonus points for every stage cleared. If you are playing for the avatar or a trophy, there are a few things you can do to improve your score. 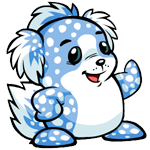 To get the most points out of every stage, use two rounds to get the Meepit's health down as low as possible without winning and then let it defeat you. After that, defeat the Meepit the remaining three rounds and move on. You should only ever attack with combo moves as they give you more points than just punching and kicking. If the Meepit is constantly blocking and won't let you attack, move in close to it and use your combo. The Meepit will take damage as you pass by them. If you wish, you can play against a friend locally with a shared keyboard. You cannot earn points in this mode. You can view and change the controls for Player 2 by choosing Options at any time. Try not to hit the Meepits when they are blocking. They will still take damage, but you won't get any points. If a Meepit is blocking, move close to it and use a combo move. You should attack with combos as often as possible to get the most points. Using movement keys will not interrupt combos, so feel free to move around and jump while attacking. You have proof yourself stronger!